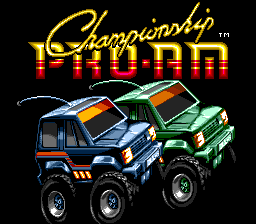 Championship Pro-Am is a racing game developed by Rare Ltd. and published by Tradewest for the Sega Mega Drive. It is a remake of R.C. Pro-Am, a game released for the Nintendo Entertainment System. R.C. Pro-Am was a popular title in its day and spawned sequels for the Nintendo Game Boy and NES. The game takes place in a isometric viewpoint. Two buttons are used: accelerates and uses the weapon/horn. Weapon power-ups can be collected throughout the track and used against an opponent to slow them down. Power-ups include; missiles (projectiles), bombs (backward released hazards), stars (increases stockpiles by 1), skulls (decrease stockpiles by 1), and roll cage power-ups (shield). Out of these only the roll cage power-up can be collected by computer opponents. Stat increasing power-ups can also be found on the courses. These power-ups include: Higher Top Speed which increases maximum speed (blue engine block icon), Turbo Acceleration which increases acceleration (blue turbo impeller icon), and Super Sticky tires which increases turning ability (black tire icon). Eight letters can be collected which spell out CHAMPION. When all the letters are collected a new vehicle will be rewarded. There are two extra vehicles that can be earned this way. Unfortunately upgrading the car resets all the Stat increases to zero. Level hazards include water puddles, oil slicks, rain clouds, and pop-up walls. Speed Panels can be found on the track which give the player a speed boost if driven on. Strangely, there is no music played while racing but music will play at the end of a race and a few other circumstances. The level ends immediately when the someone crosses the finish line and ranks are given based on current position at this time. If the player ranks fourth place it is a instant game over and the player must use one of three continues. There are twelve track layouts but these are repeated indefinitely as the game progresses but with added zippers and hazards as the level increases. Compared to the NES version, graphics and music are somewhat improved. The letters that can be collected within a level spell out "CHAMPION", rather than "NINTENDO". Spelling out "CHAMPION" a third and fourth time will earn superchargers that increase speed from 104 MPH to 108 MPH and 110 MPH. Players enter their initials at the beginning of the game, not the end. There are five opponents instead of three. Cars under the effect of the roll cage power-up cannot be destroyed by missiles or bombs. Dash Zones earn 100 times the points as the Nintendo versions. There are lap records for each track and beating the record grants 500 points. Extra continues can be won every time five consecutive races are won. Main article: Championship Pro-Am/Magazine articles.